Drought + shade tolerant pollinator-friendly mixed perennial garden surrounds landscape of flagstone patios, gravel pathways, cedar raised beds + deck. A gravel pathway enters through an abundant + mixed perennial garden of low-maintenance + pollinator-attracting perennial species: iris, spirea, grasses, sedge, sage, yarrow, hyssop, + rhododendron. 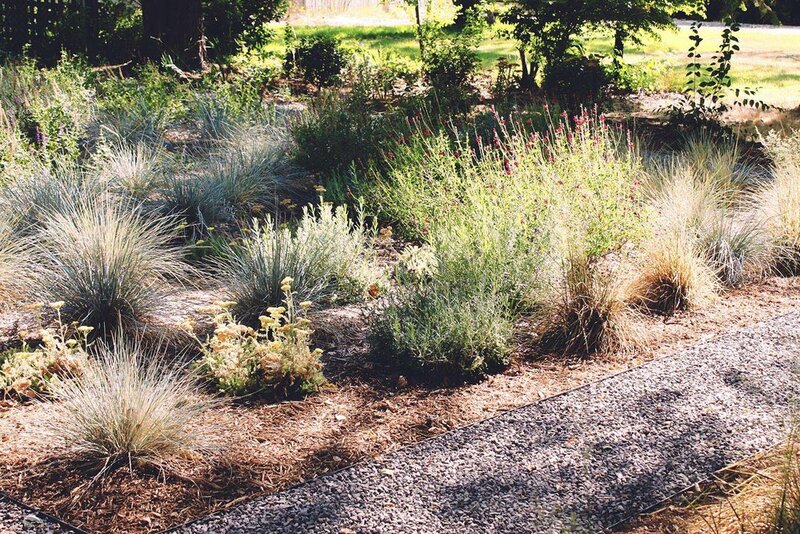 A gravel pathway meanders through a mixed perennial garden of low-maintenance + pollinator-attracting perennial species: iris, spirea, grasses, sedge, sage, yarrow, hyssop + rhododendron. Cedar deck constructed w/ simple + modern aesthetics w/ steel wire connects the front + back yards. Wrap around stairs give geometric interest and increased access to a simple + modern cedar deck. Contrasting hardscape elements of cedar and flagstone. Cedar deck steps w/ steel wire railing descends to a flagstone patio. Garden scene w/ Siberian iris, 'PJM' Rhododendron, 'Raspberry Summer' Giant Hyssop, cedar raised beds, gravel + flagstone patio + shade-tolerant perennial garden. Raised cedar garden bed filled with annual flowers. 4' x 6' raised cedar beds are perfect for summer vegetable gardening. crushed gravel pathway leads through low-maintenance + drought tolerant perennial garden: 'Terra Cotta Yarrow, Blue Oat Grass, Bronze Sedge, 'Lipstick' Sage + Meadow Sage. Mass-planted, drought-tolerant + pollinator-attracting perennial garden w/ crushed gravel pathways. Blue Oat Grass, Meadow Sage, 'Heatwave', Lipstick' + 'Hotlips' Sage, Bronze Sedge + Slough Sedge. 'Kudos Coral' Dwarf Anise Hyssop [Agastache 'Kudos Coral'].